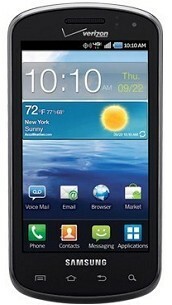 Here's a simple tip on how to factory reset the Samsung Stratosphere i405 from Verizon. The Samsung Stratosphere is Verizon’s first 4G LTE slider. This new Android handset runs on Android Gingerbread, a WVGA display Super AMOLED Plus, 5MP rear camera, and a 1.3MP front-facing camera. But however, if you'll experience any low performance, hang or frozen problem, a factory reset may help to restore back your Samsung Stratosphere to it's original factory default settings. But just ensure to have a back copy of all your important data files like contacts, messages, etc. that are stored in the handset for it will be all deleted on this process. You can either type and enter this code *2767*3855# or do a button combination below if the Samsung Stratosphere experience hang problem like just stuck on the start up logo.